Sometimes it’s hard to gauge exactly what the proper development path is for an aspiring professional hockey player. The more common the player’s attributes and background, the more common and predictably the development path for that player. 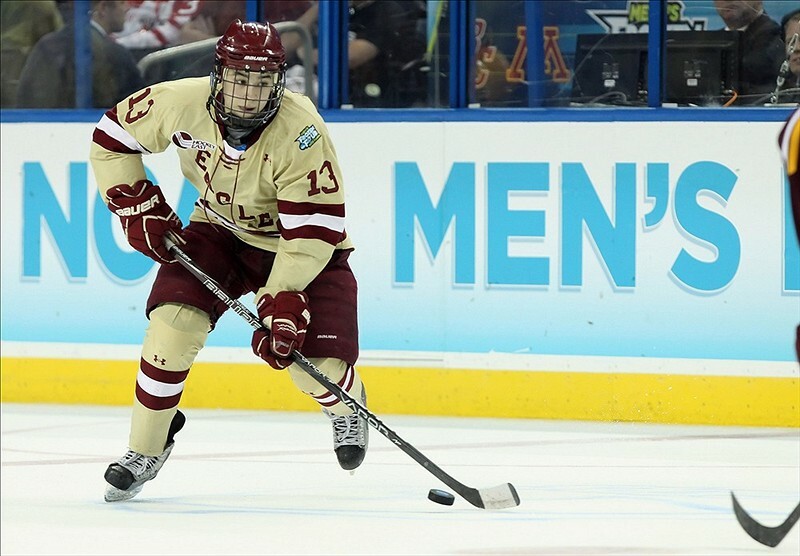 In Johnny Gaudreau’s case, there’s nothing common or predictable about him. A native of Carney’s Point, New Jersey – just outside of Philadelphia across the Delaware River – Gaudreau has had a similar hockey experience wherever he’s gone. From his time playing high school prep hockey in nearly Gloucester, NJ, or with the USHL’s Sioux Falls Fighting Saints, or in college with the NCAA’s Boston College Eagles: he’s always been smaller than everybody else on the ice, and it has never, ever mattered. No matter how much larger or scary-looking the opposition, Gaudreau has always torn apart the opposition. After the fan excitement in Calgary over his signing – the team sent a private jet to the Hobey Baker ceremony in Philadelphia, then flew him and teammate Bill Arnold to Vancouver for their NHL debuts – Gaudreau’s performance in his lone official NHL appearance to-date, a goal and a few nice chances, did little to temper expectations for the winger. The challenge for Flames management may be the lack of a clear road-map for Gaudreau. Last year, 6th overall pick Sean Monahan proved physically and mentally capable of battling against NHLers despite being barely 19. And the organization has a lengthy history of progressing players from the Canadian Hockey League through to the professional ranks, which helps inform their decision-making when it comes to charting the development of 18-year-odl Sam Bennett, their 4th overall pick from this year’s draft. But with Gaudreau, he’s easily the most offensively talented player on the ice during pre-season games – often the most talented between both teams – but his play away from the puck has left some wondering if some seasoning in the American Hockey League may be what the doctor ordered. Of course, that approach is also with a few questions – whether he can fully round out his game in the AHL while attempting to dodge the occasional physical thuggery sometimes found in that league. For his part, Gaudreau’s trying his best to make the Calgary Flames roster out of training camp. He’s buzzed around the net and generated a lot of scoring chances, including a picturesque goal that woke up the crowd during a sleepy 2-0 Flames pre-season win over Colorado. Gaudreau’s also been on the right side of the puck possession measures, though he is one of the few prospects who’s benefited from regular shifts with established NHLers – he’s played with Joe Colborne, Jiri Hudler, Matt Stajan and Paul Byron, among others. For all his offensive sizzle, Gaudreau admits he has areas where he can improve. The big question for the Calgary Flames to answer by opening day isn’t whether Gaudreau has NHL-level offensive talent. He does. It’s a fact made evident when you see him being made the focal point of the team’s power-play, with established veterans such as team captain Mark Giordano dishing him the puck on the side boards rather than shooting it. The locker room knows the kid has the straight goods inside the opposition’s blue-line. The question is whether Gaudreau will be more able to round out his game everywhere else with the AHL’s Adirondack Flames or in the NHL with big-league coaches. A year in the American League did a great deal for fellow Hobey Baker nominee Corban Knight, but respectfully Knight is more of a two-way forward who lacks Gaudreau’s offensive gifts. He needs to rely upon an all-around game to be a productive NHLer – one could argue that Gaudreau doesn’t. For his part, Gaudreau remains committed to his pre-season goal of making the Flames roster out of camp. The Calgary Flames, and the other 29 NHL clubs, have to submit their 23-man opening day roster to the league office by 5pm ET on Tuesday, October 7.